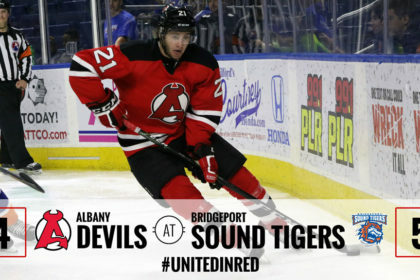 BRIDGEPORT, CT – In a mid-week contest full of big-time performances, the Albany Devils lost to the Bridgeport Sound Tigers, 5-4, in a shootout at Webster Bank Arena. 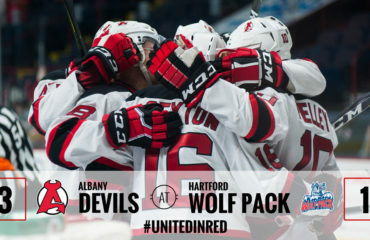 John Quenneville paced the Devils with his second consecutive three-point game and Ben Sexton and Kevin Rooney both had a goal and an assist. On the other side, Bridgeport’s Devon Toews registered four assists and Jess Graham and Joshua Winquist both had two points. 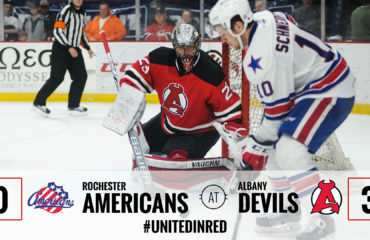 The loss was the first beyond 60 minutes for Albany this season, who go to 5-0-0-1 in games not decided in regulation. The team had its three-game winning streak snapped and moves to 12-6-0-1 overall. 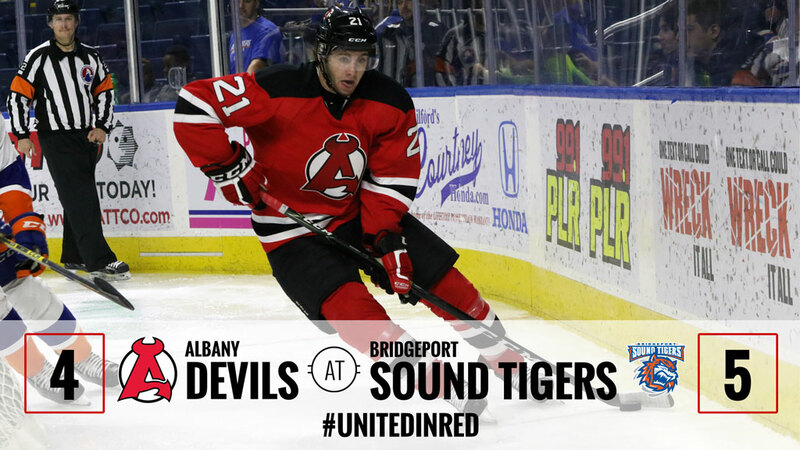 Bridgeport won for the fifth time in the last six games to improve to 13-6-0-0. After a listless first period, the Devils jumped to a two-goal lead during the first six minutes of the second. Sexton scored his fourth goal of the season at 1:28 and Rooney followed with his fifth tally at 5:48. Bridgeport countered with three straight goals before the intermission. Steve Bernier and Graham scored on power plays at 7:50 and 9:48, respectively. Then Ben Holmstrom made it a 3-2 game at 14:54. In the third, Max Novak tied the game at 2:38 with his second tally of the season and then Quenneville’s seven goal of the year gave the Devils their second lead on the power-play at 5:50. Minutes later, Bridgeport’s Joshua Winquist tied the scored at 8:59. With no scoring during the five-minute overtime, the Devils and Sound Tigers failed to convert during the first two rounds of the shootout. After Quenneville missed his attempt at the top of the third, Jon Landry won it with a wrist shot in the slot. Mackenzie Blackwood made 25 saves on 29 shots. Bridgeport’s Eamon McAdam had 24 saves on 28 shots. 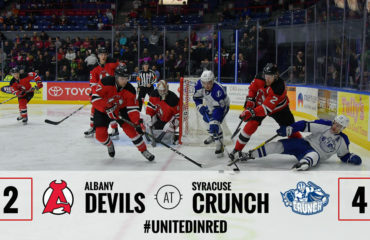 Next up, the Devils return to action Friday with a 7 pm outing against the Utica Comets at Times Union Center.